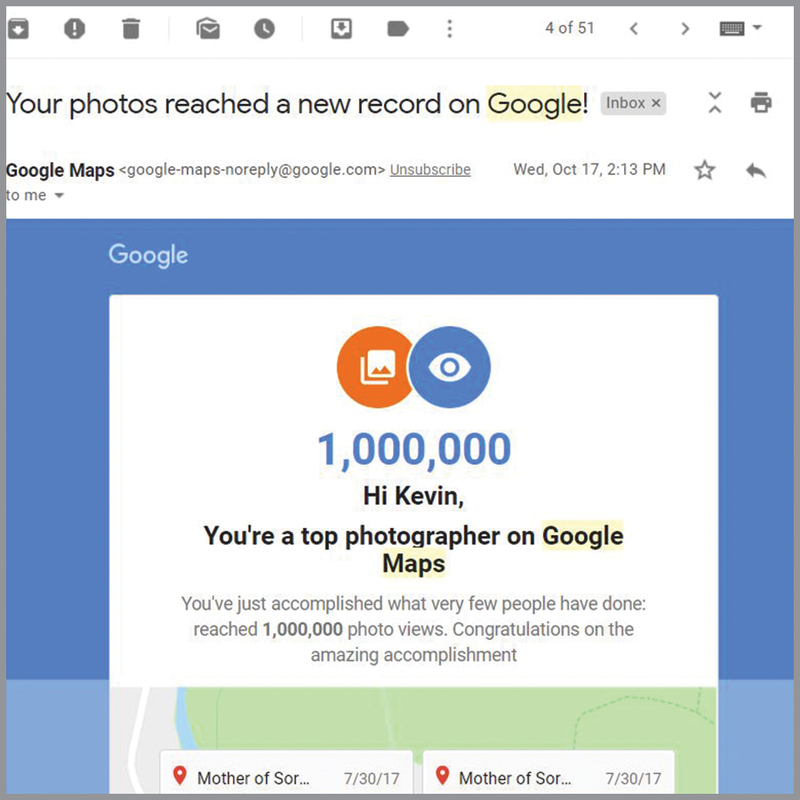 On October 17, 2018, I got an email from Google informing me that my Local Guide photos have been viewed over a million times. 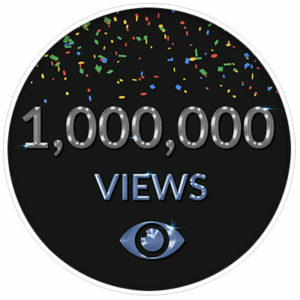 The initial feeling of seeing 1,000,000 views associated with my efforts was somewhat rewarding. But some self-imposed pat on the back for being a Google contributor is not the real story here. The data behind this number and reasons why is what should get our attention. The potential impact on businesses is the real takeaway. Let’s deconstruct what happened. Who got a million views? What was posted? Where are these photos? How were they viewed? And why does it matter for Google My Business listings? What? 156 photos. The content of these pictures relates to a location, usually a business. Some examples: a photo of the exterior of a Home Depot (44,903 views), a coffee cup with the café in the background (4,140), a popular breakfast joint (22,740) a close up of french-fries and ketchup (yes, I sometimes take silly photos; 9,949 views), wings with french-fries (9,140), glazed donuts down in Amish Country (144,415! ), a creek (4,040), sunrise at Virginia beach (3,058) and a restaurant interior in Canada (165,283!). Where? Photos are attached to the corresponding business Google My Business listing. Each listing can be found as a location on Google Maps as well as the prominent search result on Google’s search engine results (SERPs). On desktop results, it’s about 40 percent of the visible real estate. It’s important to note that on mobile results the business listing is 100 percent of the real estate, with the user having to scroll down a lot to get to standard organic results. How? Looking for a business or location. Users will see a featured photo in the search result, and then be given the opportunity to click through (or swipe) to view additional photos. And obviously, the stats reveal they are doing exactly that. Why? Why does this matter for businesses? These statistics show that Google listings are being viewed. 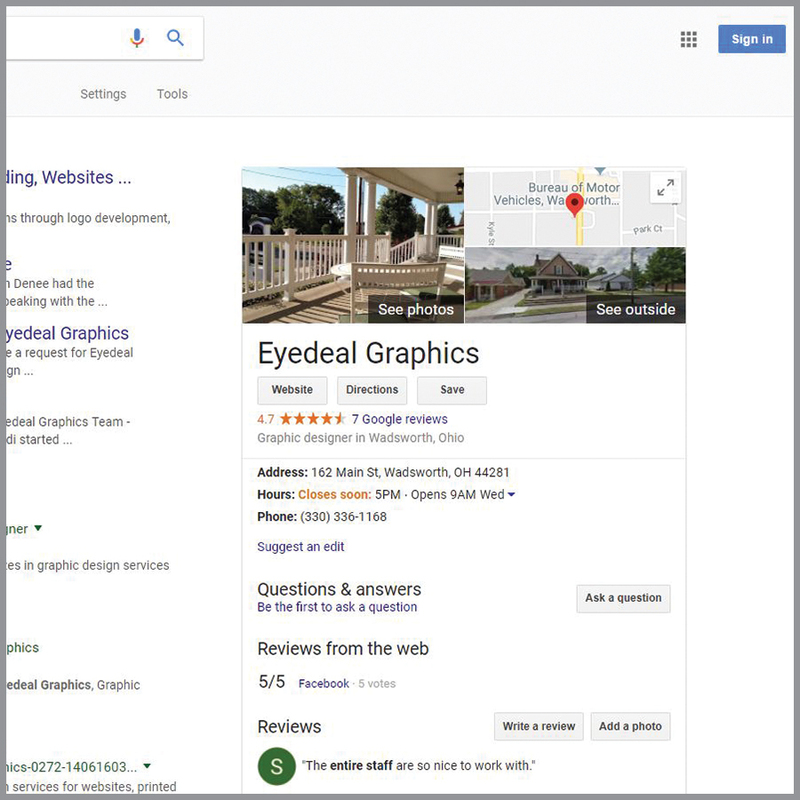 Customers and potential customers are assessing and learning about a business through Google My Business listings, including contact information, photos, reviews and posts. 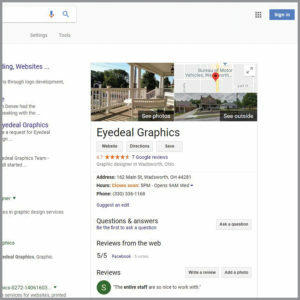 At Eyedeal Graphics, we manage and maintain Google My Business listings for many of our clients. We have access to and can see additional data regarding the number of times each listing is viewed. The data found there may be the subject of later blog articles. Obviously, this article is only focusing on Google. How big is Google? Do other search engines really matter? The reality is, at least in 2018, other search engines don’t matter. According to NetMarketShare.com, as of October 2018, Google has 90.3% of the market share in the United States and Canada, with Bing at 5.5%, Yahoo at 3.2% and DuckDuckGo at .6%. If you drill down on these numbers further and look at only mobile devices, Google has 96.9%, with Bing at .9%, Yahoo at 1.7% and DuckDuckGo at .4%. 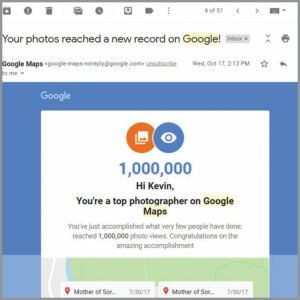 So why does your Google My Business matter? The answer is because people are seeing it all the time, likely even more than your website! Have you claimed your listing? Have you optimized it with the correct location information, hours and description information? Is your service area accurate? Have you added your photos, logos and other appropriate branding collateral? What about reviews? Are you generating and responding to Google Reviews? Are you posting the latest news, event, offer or product from your business? Your business should be the biggest contributor to the information on your listing. If not, you will have a missed opportunity to portray your business how you would like it portrayed. 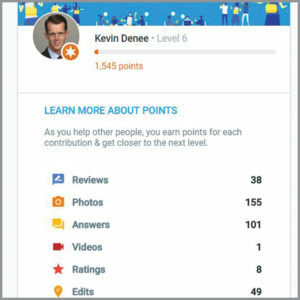 Don’t let Level-whatever Google Guides be the only ones adding information about you. If you need support with your Google My Business listing, reach out to us today.